First Yield Curve Inversion: Recession Coming? The S&P 500 rallied 1.09% on news that China and America agreed to a 90 day negotiating window where tariffs won’t be raised. Initially, the futures market rallied heavily, but during normal trading hours it wasn’t a spectacular day. This is because the prospect of a new trade deal is far from certainty. I wouldn’t be surprised if this window is extended. The deadline is now the start of March. The Chinese New Year is on February 5th which will delay substantive discussions. Politicians did what they do best. They kicked the can down the road and delayed making a decision. I’d say this is modestly positive news because there won’t be a big spike in tariffs to 25% in January, but nothing was accomplished. This result is pretty close to what I expected. I didn’t think a deal would get done last weekend. Actually, I thought a deal would get done in Q1 2019. If a deal does get done in Q1, it will be great because the 25% tariffs likely won’t be implemented. Originally, I thought stocks would rally and then fade if a deal was done because global growth is still slowing. We got a smaller rally than expected because a deal wasn’t done. I think the market reacted perfectly, which is bad for traders because there’s no way to profit off this news. Russell 2000 was up 1.02% and the Nasdaq was up 1.51%. VIX was down 9.02% to 16.44 as it has retracted most of the increase during the volatile October. The CNN fear and greed index increased from 22 to 32 which indicates fear. It is finally out of the extreme fear category. It’s the highest reading since the correction started. The S&P 500 is now up 4.37% year to date. I mentioned shorting stocks if a trade deal was made because economic growth is slowing. That’s more complicated now that a deal wasn’t made, but the tariffs will be delayed. In the intermediate term, I’m very bearish. Tactically picking your spot to short is difficult. Best sectors on Monday were technology, consumer discretionary, and energy which were up 2.11%, 2.21%, and 2.28%. Consumer staples was the only down sector as it fell 9 basis points. The biggest story on Monday was the difference between the 5 year treasury yield and the 3 year treasury yield inverted. 5 year yield and the 2 year yield both closed at 2.823%. 3 year yield closed at 2.83%. 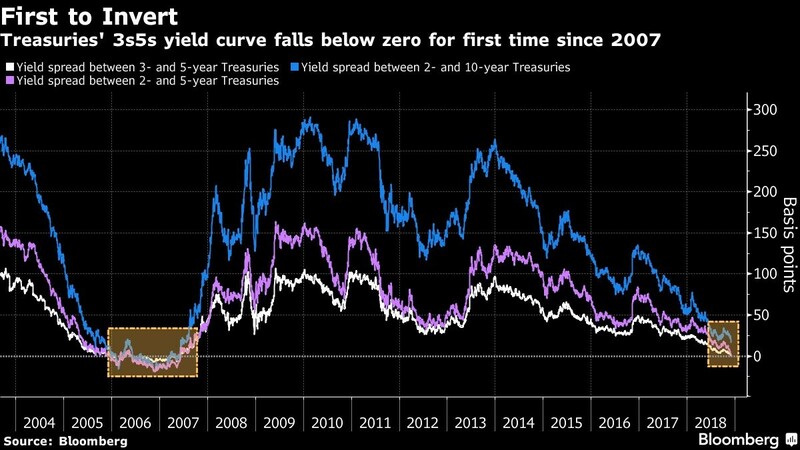 I think this yield curve flattening suggests the economy is about to go into a recession in 2020. The stock market focused on the trade news, but the bond market focused on the intermediate term cycle change. A best bullish argument for stocks is an inversion doesn’t guarantee stocks will crash in the near term. And, the yield curve inverts over a year before recessions. 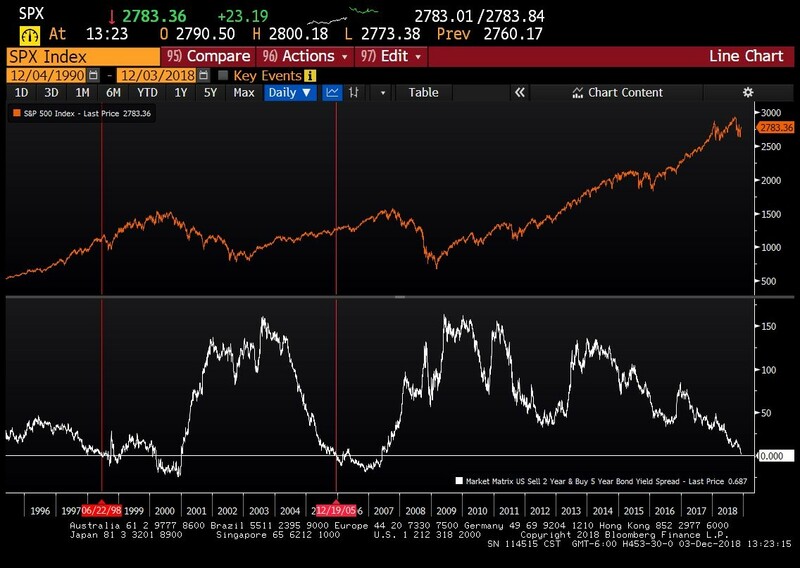 The chart below shows the difference between the 5 year yield and the 2 year yield went negative in June 1998 and December 2005. That’s about 2 years before those cycles turned. As the chart above shows, the difference between various parts of the yield curve compresses when the curve inverts. That means the difference between various parts of the curve give similar signals. That being said, it’s easier for the 5 year 3 year inversion to occur than the 10 year 2 year. The difference between the 3 month yield and the 30 year yield probably won’t invert soon. The 2 year yield increased 3.7 basis points to 2.823%. Recently, I’ve been thinking about the possibility of the 2 year yield peaking even with the Fed raising rates because the cycle is almost over. 2 year yield is still down 15 basis points from its cycle peak. 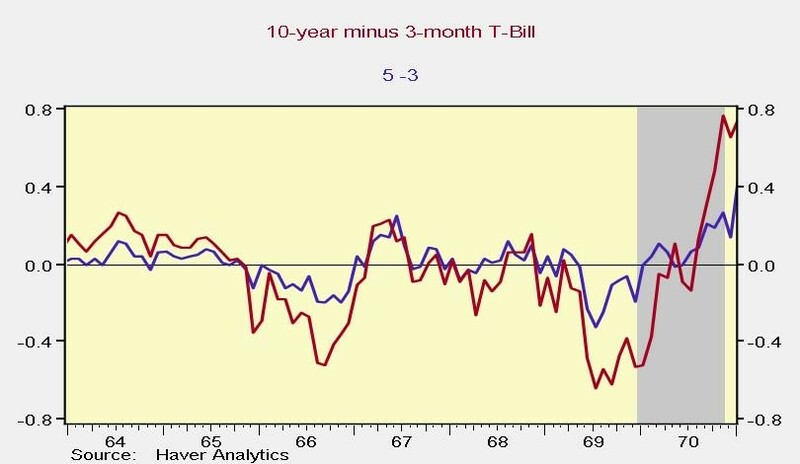 Near term treasury bill yields will be the last to peak as the Fed controls them the most. If the 2 year yield were to reach 2.97%, it would be higher than the 10 year yield which fell 2.5 basis points to 2.969%. I wouldn’t be surprised if 10 year yield doesn’t go above 3% until the curve starts to steepen. There is now a 15 basis point difference between the 10 year yield and the 2 year yield. That’s the flattest of this cycle. The curve could easily invert in the next few months. Since the 2 year yield increased, the chances of a rate hike on December 19th increased from 82.7% to 85.2%. The next Fed meeting is now in 16 days. Elephant in the room is the Fed’s dot plot showing the Fed funds rate between 3% and 3.25% in 2019, while the Fed funds futures only expect one more hike this cycle after the December one. The meeting on May 1st, 2019 is the first one of the year where the odds for a hike exceed 50%. There is currently a 51.6% chance rates are at least between 2.5% and 2.75% in May 2019. I’m expecting either 1 or 0 hikes next year because the curve will invert by the first half of next year. There are no guarantees in investing. The yield curve could be wrong, delaying a recession for a few years. In the 1960s, the yield curve first inverted 4 years before the 1970 recession. This you can see from the chart below. The 10 year minus the 3 month bill and the 5 year minus the 3 year treasury yield inverted almost simultaneously. So the curve inverted in late 1965 and stayed inverted until early 1967. Then it stayed either inverted or slightly positive up until mid 1969. Finally, in 1969 it sharply inverted which finally preceded the 1970 recession. This time is slightly different in that the 10 year yield and 3 month bill probably won’t invert for a couple months. The difference between the two is currently 58 basis points. I expect more curve flattening in the next few months. One other notable point about the chart below is the curve never sharply steepened in the 1960s. A sharp steepening indicates the economy is in a recession.